(AP) -- As IBM turns 100 this year, the anniversary coincides with another milestone: CEO Sam Palmisano is turning 60, the typical age at which an IBM CEO retires. With succession chatter growing, Palmisano has tried to tamp down speculation that he's ready to step aside, even as he's put a spotlight on his possible heirs. 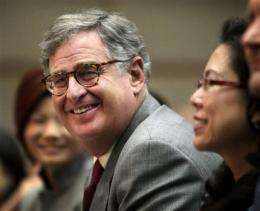 Analysts say Palmisano is likely to steer the company for the time being. IBM appears to have hit its stride after recovering from a near-death experience in the 1990s. Today, it is a model for the information-technology industry. "Sam is very much in charge and is having fun," says Bob Djurdjevic, a longtime IBM watcher and president of Annex Research Inc. "It's ridiculous to have some artificial deadline for someone to retire because creativity is not proportional to age." Djurdjevic says Palmisano is in no hurry to leave, and "the board would be crazy to force the issue just because in the past that's been the tradition." Palmisano has been CEO of the Armonk, N.Y.-based company since 2002. He succeeded Lou Gerstner, an outsider and non-techie who engineered the company's turnaround. IBM's planning for Palmisano's successor was derailed when Robert Moffat, a top candidate for the CEO job, was ensnared in what federal prosecutors have called the biggest case in history involving insider trading at a hedge fund. Moffat, who left IBM after his arrest, was sentenced in September to six months in prison for passing along confidential tips about IBM's business. The case was a rare smudge on IBM's reputation and narrowed the field of Palmisano's possible successors. Analysts and former executives say that when Palmisano does step down, IBM is likely to replace him with an insider. Many analysts point to Ginni Rometty as a leading candidate. Rometty leads IBM's global sales operation and previously headed IBM's business services division. She oversaw IBM's $3.5 billion purchase of PricewaterhouseCoopers' consulting business in 2002. Djurdjevic calls Rometty an "effervescent leader" and says she would be an ideal advocate for the company. She would be the first woman to lead IBM. A year ago, Palmisano engineered several changes to IBM's management structure that indicates Rometty is a top contender. Along with adding marketing and strategy to Rometty's assignments, Palmisano increased the responsibilities of three other executives. Mike Daniels, who led technology services, is in charge of all of IBM's services business. Analysts say Daniels is another top contender, with a style like Palmisano's. Palmisano also elevated Steve Mills, who led IBM's software division, to be in charge of all of IBM's hardware business. Mark Loughridge, IBM's chief financial officer, got an expanded role in finance. Analysts say Mills and Loughridge are longer shots. Another potential candidate is Rod Adkins, who is in charge of IBM's server, storage and semiconductor businesses, along with the supply chain. He took over after Moffat's arrest. Djurdjevic calls Adkins a "quiet overachiever." In a rare public comment on the matter, Palmisano said last year that he's "not going anywhere" and that there's no formal policy at IBM dictating when a CEO should retire. Investors appear hopeful that Palmisano will stay. IBM's stock has increased more than 25 percent since he made the announcement in September.